This seasonal transition is proving quite productive for Climbing in our area! In less than 6 months-ish we will have gained 3 New guidebooks from Vernon 1 from Sicamous the updated edition from Revelstoke and now we have a New guide coming out for Kamloops! 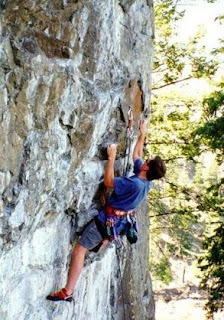 The new Kamloops climbing guide book will be done in the spring and its going to look good. It includes more than just the Beach and Roche lake but the newly developed "Hen House" with granite like rock and quite a few more areas that I , personally, have never heard of. Trevor Lott, the author has put up a link for the new cliff called Prickly Pear Canyon on his WebSite ClimbKamloops.ca. You can get his link on the left. I heard a tidbit about the best Deep Water Soloing in BC in Kamloops too... Be excited... be very excited.